The latest versions of Bing Ads Editor for Mac and Windows have new features. 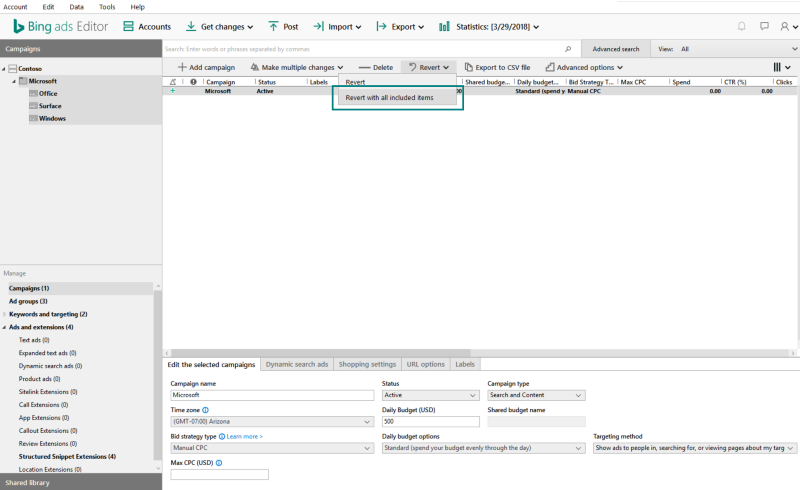 Bing Ads is releasing some additional productivity and time-saving tools for users managing their campaigns via Bing Ads Editor. Already available in the Windows version of Editor, label management are now available in Bing Ads Editor for Mac. Users of either the Mac or Windows version of Editor can now revert changes faster. Bulk structured snippet managment is now available in the Windows version of Editor and will be coming soon to the Mac version. Labels can help search marketers organize their accounts in ways that are meaningful for them so they can filter and pull results and make changes faster. For example, they may want to create a label for evergreen ads vs. sale ads to easily see performance at a glance. Structured snippets function as an additional tool in text ads that allows advertisers to create lists of a category. For example, lawyers could list the type of law they practice, or food delivery services that cater to certain diets can highlight the types of cuisine they offer. Make several changes and you need to wipe them clean? There is now also an option to revert to the original version of what you had, effectively undoing all changes you’ve made to a campaign. All features are now available in the most recent version of Bing Ads Editor.